The urban project is still largely the project of the public space. The discussion faces a traditional theme of urban studies, from a double perspective. On one side stating the usefulness of a relational approach, which uses the categories of intimité, extimité and public, at the center of which there is the body, even before the right of access to public space. On the other hand, claiming the public power of the interiors, beyond the physical and social continuity of the Modern conception of the public space. The two views are not without problems. Their advantage is to reposition the issue out of an acquiescent debate, marked by conservatism. 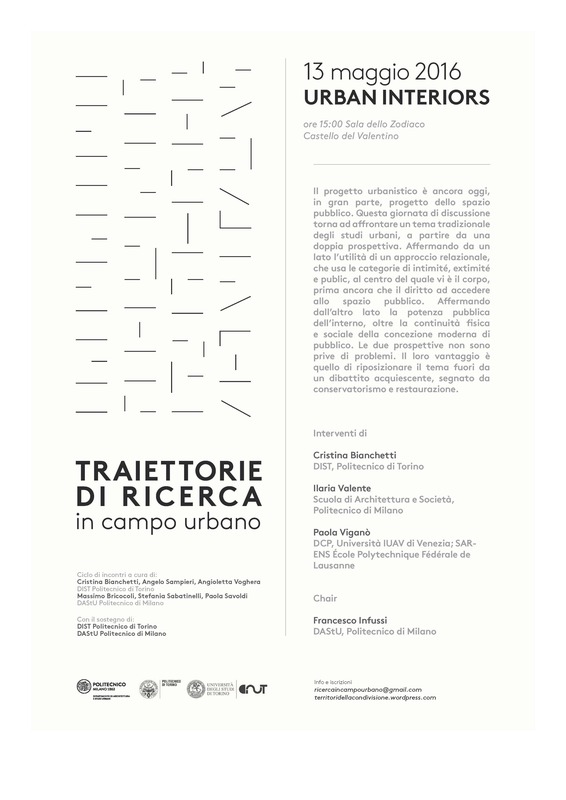 Il quarto incontro di Traiettorie di ricerca in campo urbano si terrà venerdì 13 maggio dalle ore 15 nella sala Zodiaco, presso il Castello del Valentino. Interverranno: Franco Infussi, professore di Urbanistica presso il Politecnico di Milano, Paola Viganò professoressa di Urbanistica presso lo IUAV e l’EPFL, Ilaria Valente preside della Scuola di Architettura, Urbanistica e Ingegneria delle Costruzioni del Politecnico di Milano.